The team behind a social network being used by Islamic State (IS) militants has admitted it cannot prevent the spread of extremist material. Diaspora is a decentralised network with data stored on many private servers which cannot be controlled by any single administrator. IS is believed to have switched to Diaspora after Twitter upped its efforts to block accounts. Diaspora's creators said they were "concerned" about the activities. In a blog post, they wrote: "Various newspapers have reported that members of the Islamic State (IS) have set up accounts on Diaspora to promote the group's activities. "In the past, they have used Twitter and other platforms, and are now migrating to free and open source software." The post explained that Diaspora's network is spread across several independent servers - known as pods - which are not controlled by the Diaspora team. "There is therefore no way for the project's core team to manipulate or remove contents from a particular node in the network (which we call a "pod")," the blog post explained. "This may be one of the reasons which attracted IS activists to our network." 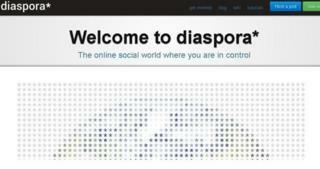 Diaspora was launched in 2010, paid for by a crowdfunding campaign set up by four students in New York. Diaspora said it was contacting administrators of the individual pods - known as podmins - to alert them to the problem of extremist content, stressing the legal implications of hosting such material. "Because this is such a crucial issue, we have also accumulated a list of accounts related to IS fighters, which are spread over a large number of pods, and we are in the process of talking to the podmins of those pods. "So far, all of the larger pods have removed the IS-related accounts and posts." A bigger challenge is in contacting owners of smaller pods to ask for material to be taken down, the team said. Before shifting some of its focus to Diaspora, much of IS's efforts were focused on Twitter. But in the past week, the site has been pro-active in removing the accounts of IS members and supporters. It has since widened that scope to include any member who shares graphic images of video relating to the killing of US photojournalist James Foley. However, Diaspora, due to its nature, will be unable to take similar action. It is therefore unsurprising that IS would turn to the network, argued Jamie Bartlett, author of The Dark Net, a book looking at hidden internet services and decentralised social networks. "Not a great deal can be done," he told the BBC. "In terms of the base technology, decentralised services are incredibly difficult for police to get a handle on. Every time they're clamped down on - the services get a bit smarter, a bit better at evading detection. "It's absolutely inevitable that organisations like IS are going to be among the early adopters of this sort of innovation."